Genesis Ristar (JPN) in 28:17.37 by Upthorn. Ristar is a large, colorful game with good music. 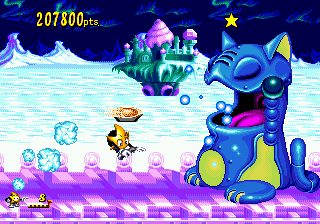 It also has water-themed levels that aren't slow and boring, which is a true rarity. The author of this TAS chose to get maximum height bonuses instead of using the end pole for a small, boring speed boost. As Bag of Magic Food so excellently put it, "Starface has stretchy arms and wastes time spinning on poles."